Its only been about 3 years since I wrote my last post on racing in 2006 over at The Sky Life, and it ended something like this. 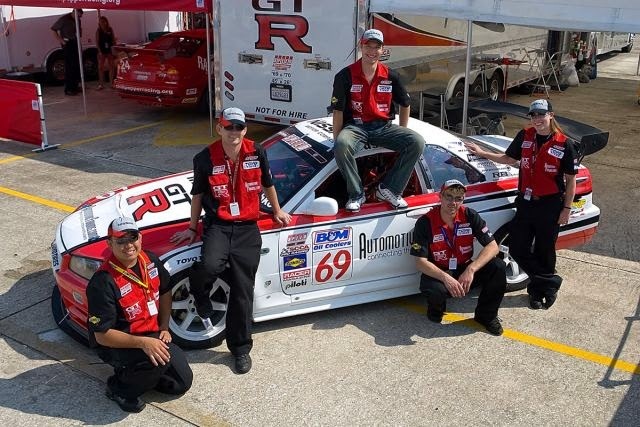 After Roebling Road, we packed up and headed for Sebring, the first race of the year withSCCA Pro. Some good some bad. We made it. Made it to the first race. Full crew, car(and a spare), team. 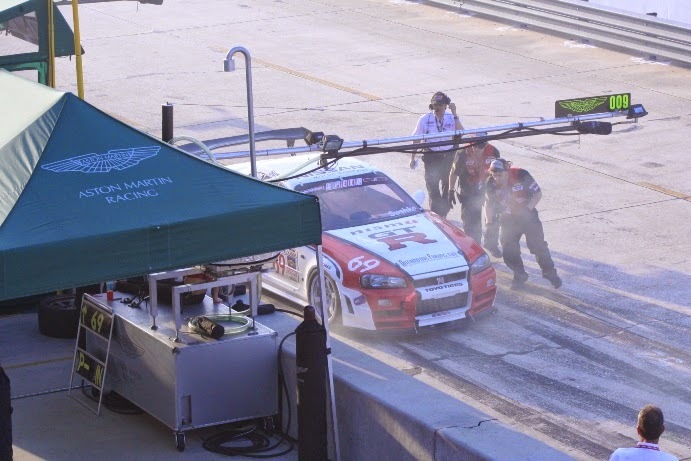 The #1 car ran(ex- Fujitsubo), we had tested it at Roebling Road, and we were prepared for our first professional race of the 2006 World Challenge GT season. Sebring is a rough track. Well its really not even a track. Its an ex-runway, that became a track. It beats up cars, and it beat us up a bit. Before you are allowed on track, the SCCA Pro officials have to come around and do a tech inspection on your car. 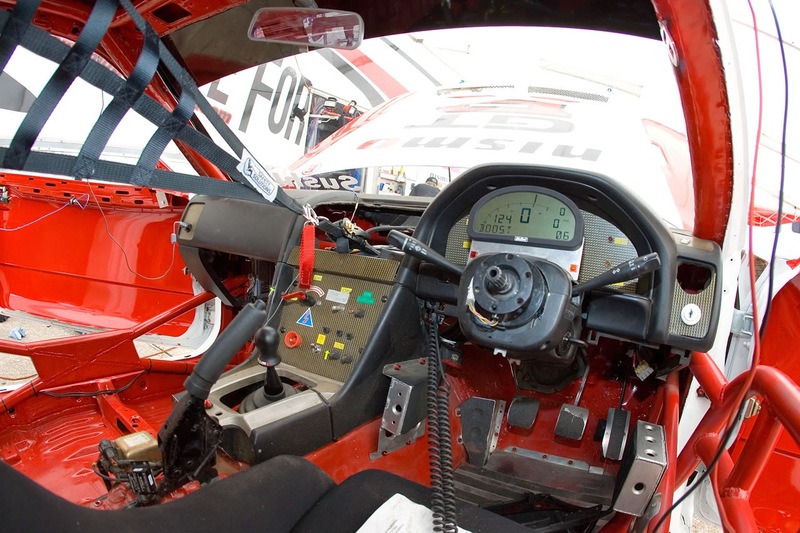 There are many items in the rule book, to keep the driver, car, and fans safe if anything goes wrong. This was pro racing, so a little bumping and grinding happens, cars do go off track and crash. It really isn't a problem for cars to touch, but punting a car, that is frowned upon. After we passed the tech inspection, we were ready for our first time on track. So, we had the race rig, two cars, lots of spares, people. One thing we were missing was any kind of golf cart. Just something we didn't think a lot about, but honestly its necessary for racing at this level. 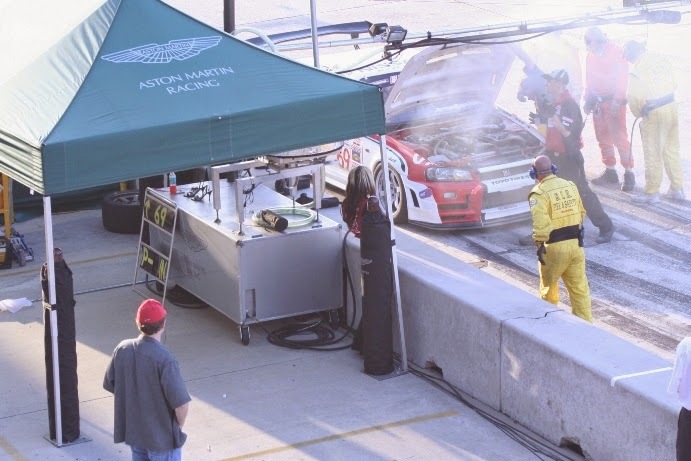 Since World Challenge is a support race for other series, like CART, like ALMS, and NASCAR, the World Challenge cold pits, are often far, far away from the hot pit. We were the ones pushing our tool box to the wall. It felt like our first professional race. On the white Volk Racing TE37. These like the bronze are 18 x 10.5. The hot pit is where you see the work on the car go on during a race. World Challenge races are 50 minutes long, so if you have to pit, you aren't going to be able to do well. Essentially a 50 minute sprint race. So after our first session, we had a number of issues to sort out. Our Motec dash wasn't picking up the timing beacon (this is pre GPS based systems). It would get a lap, then drop a couple, then get a lap. So we spent a ton of time troubleshooting with the guys at the track, and in Australia. The nice part about being at a pro race, is that the support crews for many of the products are there. We were way off pace. I mean way off pace. Not just our times, but our speeds. 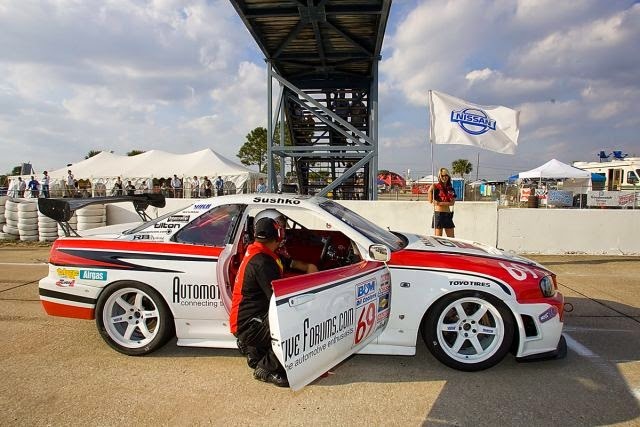 SCCA says that a World Challenge GT car is about 3000 lbs, and 500 hp. No. Not really. 2700 lbs, and 550+ was what we were going to need. 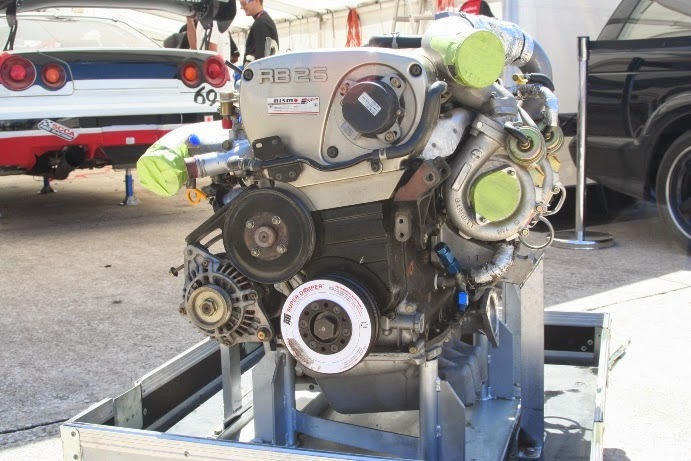 The Super Taikyu spec engine was 450 hp at the engine at 16 psi. Around 400 at the wheels at 16 psi. However we were running about 23 psi peak dropping to about 19 at redline with the old engine, giving us 450 hp to the tires. Not enough power,and with our non-experience, we needed everything we could stacked in our favor. For some reason, that I spent too much time troubleshooting, our brand new engine, with all the same parts as the old engine, was only doing 16 psi. I checked and double checked everything, and I couldn't figure it out. It just wasn't making the boost it should. It drove me nuts. It took a while, but we finally figured it out. 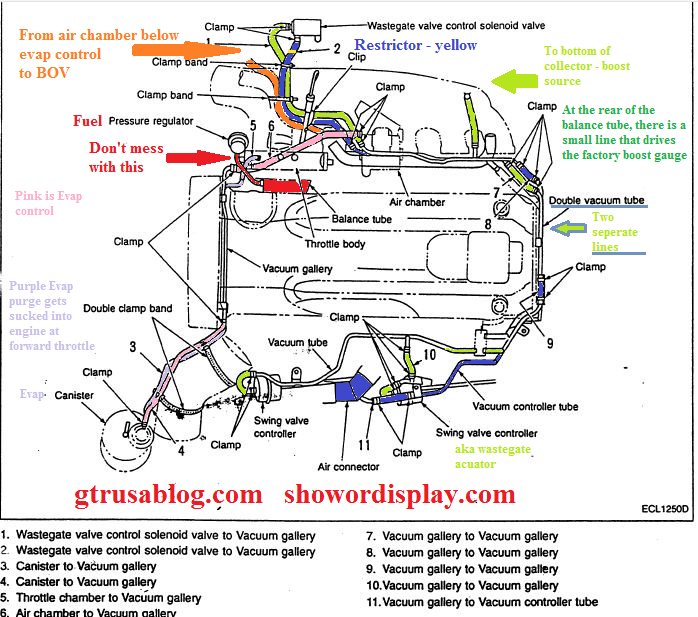 The green line that goes from the collector to the wastegate lines, at the green arrow below had a restrictor in it. Without the restrictor, the car would only make 16 psi. With it, it made 23 psi. In practice #1 - 3-15-2006, we were #27 of 32 cars. 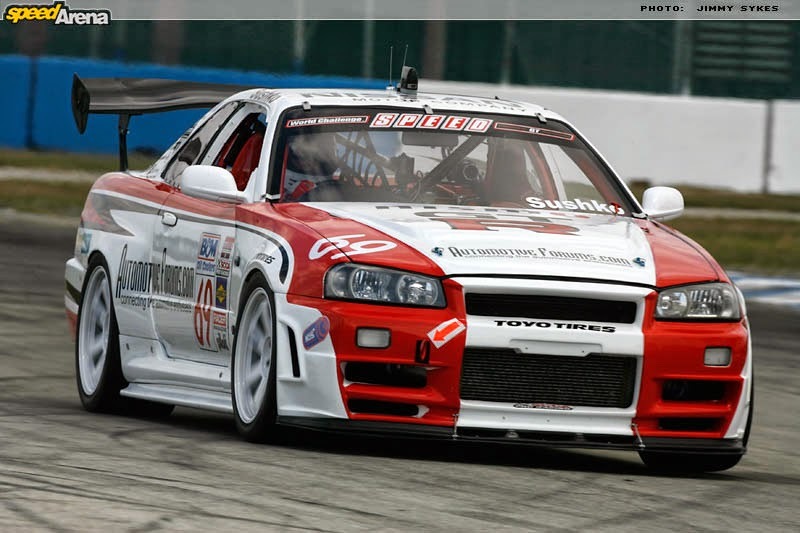 The Automotive Forums R34 did a fast lap time of 2:28.154 @ 89.906 mph. Not the slowest, but far, far off pace. The #26 car a Dodge Viper driven by Ed Braswell did a 2:19.046 @ 95.795mph. The fast car for this practice was Mike McCann in a Dodge Viper with a 2:10:120 @ 102.367 mph. The top three cars in the 2:10 range. The top 11 in the 2:12 range. So 16 seconds, well that might as well be a life time. Practice #2 was run the same day at 5 pm. By then Igor was #25 fast of 32 cars with a 2:19.776 @ 95.295 mph. The #24 car was Ed in his Viper with a 2:17.249 @ 97.049 mph. The top of the field was Leighton Reese in a Chevrolet Corvette with a 2:09.666 @ 102.775 mph. There were 4 cars in the 2:09s, and 13 cars under 2:12. Even though we had picked up 9 seconds, we needed another 7 seconds to be up mid pack, where we wanted to be. Lou Gigliotti in his Corvette was #2 fast in practice with a 2:09.844. Just to show how much power, and how fast that car was, check out this video of it, running mid 10's at 140 mph with a ton of wheel spin. Really nice sounding LS engine. They claimed 535 whp. Crap welcome to the real world of racing. Qualifying went off the next day 3-16-2006. 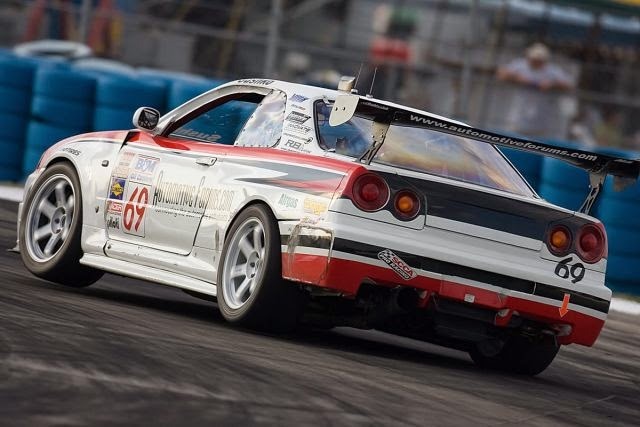 Igor and the R34 had picked up a little speed, but dropped one position, #26 of 31 cars. 2:17.284 @ 97.025 mph. The #1 qualifier, Leighton Reese in his Corvette did a 2:08.764(new track record) @ 103.445 mph. Still 9 seconds off pace, but now picking up speed slowly. The race. What happened in the race? Good question. I don't really remember the start. 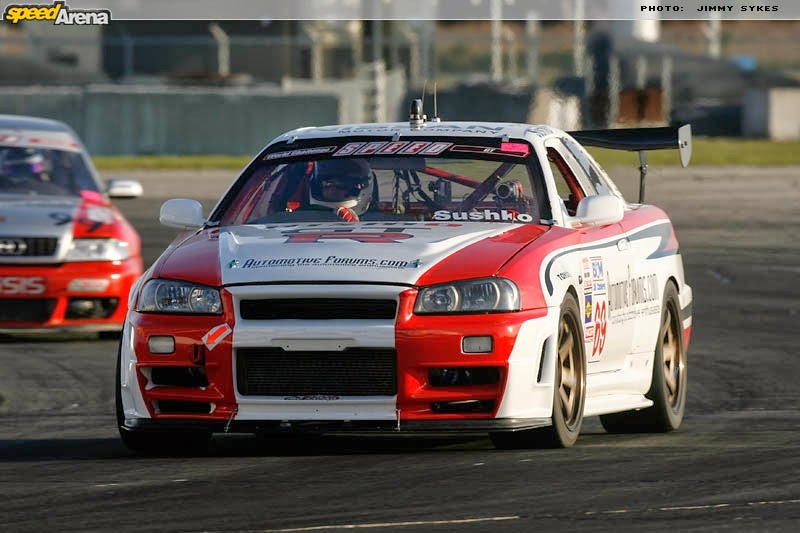 The GT-R was always going to be fast off the line. With all wheel drive, it was not difficult to get a good launch and pass a few cars. However we were pretty far off pace, and the race is not won in the first corner, but often lost. First turn crashes are common in all kinds of motorsport. Red mist, and one car hits another, that can collect ten more. We did have some side/side contact with a 911. Just a racing incident, nothing came of it but a donut on the left rear quarter. About 10 laps in, we get a report over the radio, from the series that the car is smoking. They are monitoring it, and will bring us in if it continues. So at 13 laps into the race, after we have run a best lap of 2:19.220 @ 95.676 mph, they black flag us. Igor comes into the pits, and we start checking the car over. Josh goes to the rear of the car, and I open the hood. Josh yells "Fire". So earlier in the week we were talking about the fire extinguisher. It had this plastic tag to prevent the pin from being pulled out. It was a 1/2 way serious looking piece of plastic. When I ran to grab the fire extinguisher, I thought of that tab for a split second, and yanked the pin with everything I had. I ended up tossing the pin across pit lane. It was returned, and I still have it. Buried in extinguisher powder. I was in the US Navy for six years. I was an engineer, gas turbine electrician. I had gone though tons of fire fighting school, and training. A fire was just another thing, we were prepared. Igor got out quick, and the fire was out fast. Slowly dissipating. However, not a nice way to start our first race. a DNF 13 laps in. Turns out Sebring had really beat us up. Fire out, reflash watch set. You might only get that if you were in the Navy. So what had happened, was a bolt came out of the oil feed line support to the turbo. This was a hard line that was looped. Brand new line, on a brand new engine. At Sebring it split the line. The oil dripped onto the fiberglass heat wrap on the turbo downpipe, and that flashed into a fire when we opened the hood. Right side of the picture, the looped line cracked. The car still ran, and we actually drove it back to the pits. Minor. Disappointing. Our next race was less than 14 days away at St. Petersburg. So the bigger question was, where we going to pick up 7- 9 seconds? In two weeks. In Florida? We setup for some testing, so the next installment is about our test at what was then Moroso Racetrack. Picking up the inside left tire. Donut from Porsche visible. Photos by Richard Prince Photography, via Automotive Forums , and the internet. A few of these I found years later, and not sure where they came from.